While it hopefully never happens to you, there are some cases in which a failed bunion surgery leaves a patient in more pain than they had before the procedure. A failed bunion surgery can happen when the bunions return even after the surgery has been completed. This is a painful process that can happen if the bone is unable to completely heal. Sometimes, bunions can return if the post-procedure care process was not as carefully considered as it could have been. So, what happens when the first bunion surgery fails? How can a correction surgery solve the problem once and for all? 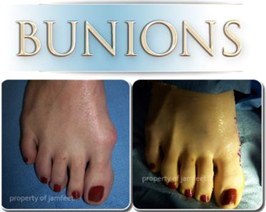 At Jamfeet, we offer a precise revision bunion surgery in Los Angeles for failed bunionectomy surgeries. There are many ways in which Dr. Jamshidinia can correct the pains you’re experiencing on your foot. The biggest key to ensuring that the revision is done right is to know what went wrong the first time around. That way, the mistakes can be avoided in the future and other symptoms can be taken into consideration. It won’t take long to notice whether a bunion surgery has failed. In this case, it’s best to seek bunion surgery in Los Angeles as quickly as possible. Dr. Jamshidinia is always available to schedule a consultation to help relieve your pain. Bunion correction surgery is always a viable option for those who have expressed extreme dissatisfaction with their former bunion procedure. This is especially true if the patient is suffering from pain, deformities, or a recurrence of the bunions. The biggest reason why a revision needs to be made is because the former surgeon did not address the big toe joint, which can result in the patient being unable to move their big toe as much as they could before. It is important to keep in mind that bunion revision procedures are more complex than initial bunion procedures, but specialized professionals can do it right. This is because the joint of the big toe, also known as the Proximal Articular Set Angle of the big toe joint, can erode over time and needs to be given attention as quickly as possible. In most cases, you will be approved for this important procedure. However, it’s important to keep in mind that you must establish an open and honest line of communication with your surgeon, so that they may best assess your needs. The procedure lasts a little longer than an initial bunion surgery does. This is because specific techniques may be needed to help correct the issues. Your surgeon may recommend that you keep pressure and weight off your foot for a long period of time, and perhaps wear wrapping to keep it protected. After surgery, you should expect to have your sutures for about two weeks. Try keeping as much weight and pressure off your foot as you can, until your surgery says you are ready to walk again. Did your bunions return? Are you dealing with a disfigurement? Bunion surgery in Los Angeles is possible to address your pain. It’s important to get help for this condition as quickly as possible, for the best chances of recovery and revision. For more information, our friendly staff members are here to help! You can contact us online or give us a call at (310) 247-9255. Is it Time to Start Worrying about Your Bunions? Look down at your feet – do you notice your big toe pushing against the next toe? This shift can be caused by many things, forcing the joint of your big toe to get bigger and push out. The result is a bunion – a painful bony bump that develops on the inside of the foot at the big toe joint. Over time, bunions may progress in size and severity. If left untreated, a bunion may develop into a severe disfigured foot deformity. Read up on professional bunion treatment in Beverly Hills here. • Hereditary: Bunions can run in the family. This may be one of the many problems caused by weak foot structure and develop with arthritis. • Foot Injuries: Direct trauma or impact to the ligaments on the inside of the foot. • Structural: Increased length of the first metatarsal bone in the foot. • Footwear: Poorly fitted shoes (footwear that is too tight, too narrow or too pointed) are more susceptible to bunions. Wearing high heeled shoes regularly also increase the risk of developing bunions. The pressure on the forefoot considerably increases as the heel is raised up. • Swelling or enlargement of the metatarsophalangeal joint at the base of the big toe. • Displacement of the big toe pushing toward the other toes. • Joint redness and tenderness. • Join pain or stiffness. • Skin irritation over the bunion. • Persistent or intermittent pain. • Restricted movement of your big toe if arthritis affects the toe. • Persistent big toe or foot pain that interferes with walking or daily activities. • An overlap between your big toe and your second toe. • A visible bump on your big toe joint. • Decreased movement of your big toe or foot. • Difficulty finding shoes that fit properly because of a bunion. If these symptoms increase or do not improve after 2 to 3 weeks of home treatment, call your doctor. It is important to understand that not all bunions progress and become worse. Some bunions never change in size or severity. Below are non-surgical measures to mitigate progression of a bunion. • Choosing the right footwear. Avoid shoes that restrict blood flow. Pointy shoes directly push on the big toe, irritating and limiting movement. High heels alter foot mechanics so limit time and regularity in them. • Strengthen your foot muscles. It is important to strengthen your foot muscles to counteract the muscular imbalance. You can pick up marbles or a towel with your toes. • Support your arch. Foot deformities tend to occur in people with flat feet. Look for footwear with arch support to help promote a proper alignment. If you suspect that a bunion, seek out professional bunion treatment in Beverly Hills. Dr. Jamshidinia at Century City Medical Plaza is a board-certified foot surgeon trained in all areas of surgical foot treatments. He is Board Certified by the American Board of Podiatric Surgery and a Fellow of the American College of Foot and Ankle Surgeons. For concerns regarding common foot injuries do not hesitate to contact us today! Do you dread the thought of putting on shoes every morning? Is that bony bump on the side of your foot starting to become too painful to bear? Let’s face it, bunions aren’t fun. Not only are they painful, but they’re also quite unsightly. The good news, however, is that you can treat some symptoms of bunions from the comfort of your own home. While the permanent fix requires surgery to realign joints, these home remedies can help soothe your pain in the meantime. Toe exercises, such as toe stretches, resistance exercises and towel curls: Keep your foot flexible by doing simple daily exercises. Stretch your toes by pointing them straight for five seconds before curling them under for another five seconds. Deep-tissue massage: Use your fingertips to gently massage muscles around the bunion in a circular motion until you feel the tension loosen. You may want to apply an ice pack following your massage. Use cushions and pads to reduce pressure: Pointed-toe heels and other narrow shoes cause bunions. You can relieve the pressure by wearing supportive shoes and sole inserts. Ever heard of custom orthotics? Avoid tight fitting shoes, such as high heels: Sturdy shoes are a must for people who are constantly on their feet. Temporary relief from ice packs: Wrap ice in a towel before applying it to the bunion. This will help reduce inflammation and pain. Barefoot yoga to work foot muscles: Certain yoga poses help strengthen the feet muscles. You may also try long walks at the beach. Sure, it may sound silly now, but walking in sand helps exercise the feet. These non-surgical methods won’t cure bunions, but they can slow growth and provide some much appreciated pain relief. If you find at-home remedies aren’t enough to soothe your painful bunion, call our Los Angeles office today at (310) 247-9255. In the name of style, we often neglect comfort and sentence our feet to pain and discomfort. Common foot problems such as bunions or hammertoes are already in our genes and wearing the wrong shoes can accelerate those issues over time. Avoiding these types of footwear can prevent those problems from progressing. Ladies, it is always a bad idea. They offer no support for the metatarsalgia (balls of your feet) and they place your foot in an awkward position. This style of shoes can lead to sprained ankles because of the lack of support. However, stylish they may be, it is best to wear these for special occasions only and for no more than 20 minutes at a time. Fashion tells us, the higher the heel the better. However, these shoes are suicide for your feet, because of the added stress that is placed on the ball of the foot. Wearing these shoes for a longer period of time can damage the bone structure of your feet and it can lead to fractures. This trend is starting to affect both men and women. These shoes provide very little room for toes and as a result they squeeze the toes together, over time this can lead to toe deformities such as hammertoe. Squeezing into smaller size shoes can cause significant problems. ABC News reports that one in every six people have problems with their feet. Continuing to wear the wrong size shoes can lead to severe bunion pain, toe cramping, improper stride and lower back problems. Avoid uncomfortable footwear whenever possible; leave the heels at home for special occasions. If you must wear heels, chunky heels are best for your feet because they provide steady support for your heels and can prevent straining your feet. Of course, these shoes should also only be worn occasionally. If your feet are prone to bunions, take care of your feet now but wearing the proper footwear. Once bunions begin to form they are only removable by bunion surgery. Protect your feet as much as you can, opt for shoes with a low heel and place shoe inserts for added support. Reversing foot deformities of any kind is often difficult and can be painful. If you have painful bunions, contact your foot doctor in Los Angeles for bunion treatment.